It's that time of the year again . . .
Ness carved this wicked face and has been answering the door to loads of kids with her vampire teeth in (I've got some too). Of course the kids don't realise it's the ancient fire festival of Samhaine - they call it something else. The beginning and end of the witches year as they parade in their plastic finery munching sticky, unhealthy sweeties as they squeal and shriek their way down the road ! We'll be on Safari tomorrow - we've been and bought some charcoal sticks for our handwarmers. 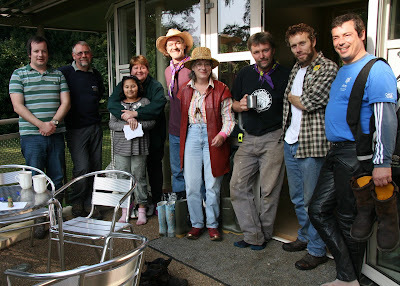 Jo, Vanessa, Me, Tony (Chadwick of the Woodland Trust) & Andy. Amazingly the smiles look quite genuine at the end of our event. No scouts had booked in for our afternoon session but we were greeted by pouring rain all morning. I would have rather been anywhere than there today. 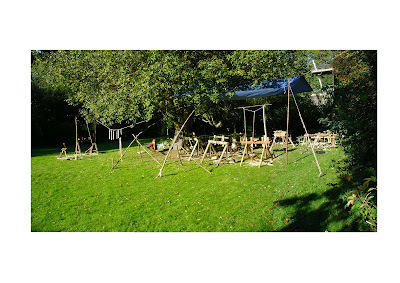 What made it worse was that someone had destroyed the willow figures Jo had been weaving with the kids. We somehow made it through in our shell-shocked state and this photo was taken just before we packed up. I would never do a 7-day event like that again and certainly not under the circumstances and in that location. What an exhausting week running the Hainault Forest Woodland Craft Workshop - but good fun! We've had schoolchildren visiting in 2 hour sessions - up to 30 in a group, aged 5-11. A lot were special needs including handicapped, emotionally disturbed, blind & partially sighted. They had a go at turning, willow weaving and we all had fun playing in The Woodland Orchestra . . . In both photos you see a big blue container. This is where we had to pack everything away each night as Hainault is a public Forest and there are quite a few vandalistic neds around. So we had to put up and take it all down each day - not ideal. Also I've been working with Sweet Chestnut (Castanea sativa) all week. It's a lovely wood but it's full of tannic acid. This reacts with the iron in the steel and builds up as a purple gunk on all the tool edges. It also does my hands in something rotten - my thumb and finger ends are all split and cracked. This weekend we are entertaining the Scouts and Beavers although only a half day on Sunday. I'm looking forward to next Monday morning's lie-in ! They say the best things in life are free . . . we drove up to Ely accompanied by a gorgeous sunrise and home watching a glorious sunset plus it was sunny all day but with a bitter little wind nagging at the edges. However takings were well down on previous years as the recession and general uncertainty begin to bite - mercifully we get a demonstrators fee ! One thing about keeping this blog is that when I meet people who read it regularly I can't tell them about what I've been up to - they already know ! Today we're gearing up for a whole weeks event at Hainault Forest organised by the Woodland Trust. During the weekdays we will have special needs kids - blind, partially sighted, wheelchair bound and emotionally disturbed - and at the weekend some Scouts & Beavers. I'll report how it's going during the week. Andy Bisgrove will be there, me and Vanessa and Jo Hammond who's going to weave some dancing figures to fit in with our "Woodland Orchestra" theme. Should be fun . . . Note my new Link in the sidebar to Mark Allery's blog - Woodland Antics. Similar to mine, but, completely different . . .
Had a proper day off today . . . I went and explored some woods in Hertfordshire with my mate Gary. and of course, like the honourable chavs/bushcrafters we are, had our fire. We went to Home Woods & Northhaw Woods both near Cuffley. I spotted this massive pile of fresh butts near the car park at Northhaw - mainly birch and oak. I think this was the home of some elves . . .
and this beautiful "green tunnel" is framed on the left by hornbeam pollards marking an ancient boundary. It's suddenly got cold tonight so I lit the fire. I think it's birch, sycamore, *strawberry and ash. *Arbutus unedo - Strawberry Tree. I got some a couple of years ago but it was too skinny and cranky to be much use apart from firewood. Christina Joachim of the Woodland Trust emailed some pics of last weekend's event. This is a nice one of the event team . . .
At the weekend I was chatting with John Michell who we met last year at the International Scouts Centenary Jamboree. He manages a wood for the Woodland Trust and burns charcoal. He mentioned that he lives in Mendlesham, Suffolk so I asked if he'd heard about Mendlesham chairs. "I live at 16 Front Street where Richard Day was born in 1785" was the surprise answer ! 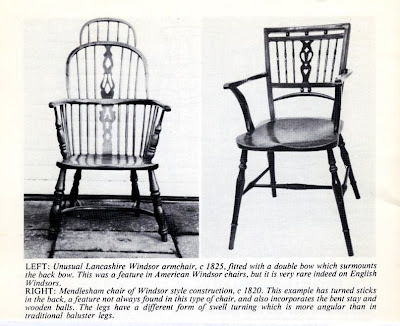 Day made his chairs in Mendlesham in the early 19th century. The undercarriage is similar to Windsor construction but the back is framed up in the style of a Sheraton chair. He used yew and fruit wood and chairs nearly all have one or two lines of boxwood stringing in the back rails and splat. However he didn't sign his work and I don't think a marked example has ever been found. If they ever come on the market they sell for a large sum. Last night about 9 our neighbours little boy knocked on the door in his underpants to ask if we could come and help his mum as she'd fallen downstairs ! She looked in a bad way so I called the paramedics. Vanessa came and sat with her and after getting him to put some clothes on I took him round to our house and tried to calm him down. 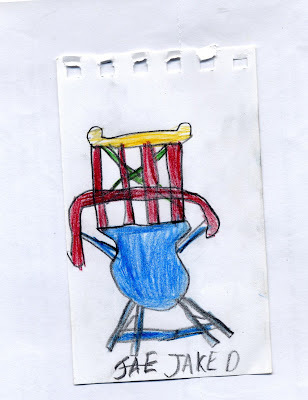 I gave him a set of twig crayons and a twig pencil and he did the very sweet drawing of my Goldsmith Windsor - I think there's some talent there, let's hope he gets some encouragement. I just realised that last Saturday marked the 1st Birthday of the Bodger's Blog. The 188 posts works out at around 1 every 2 days.